Ogden on Politics: Bicyclist Killed on Southside, Were the Madison Avenue "Bike Lanes" the Fault? Bicyclist Killed on Southside, Were the Madison Avenue "Bike Lanes" the Fault? While working the polls, a voter I had never met before came up to me saying he had voted against Mayor Ballard because of the poorly designed bike lanes. He said two bicyclists had been killed on them within the past week or so, one on the northside and one on the southside. I haven't been able to confirm those deaths were in bike lanes. However, on my way home from working a southside polling place, I traveled up Madison Avenue where I had heard a bicycle fatality had happened on Monday. There are two very narrow traffic lanes going each direction with a turn lane in the middle. The outer lanes are bordered by a high curb. On the pavement alongside the curb, along the edge of the outer traffic lane is a painted emblem of a bike with signs along the road saying it has a bike lane. dangerous situation for a bicyclist. But there is no actual line on Madison Avenue designating a bike lane! Again, they are simply bike lane emblems in a narrow traffic lane with bike lane signage. There is no place to actually put a bike lane if they wanted. Unfortunately my cell phone had died earlier in the day or I would have taken a photograph. Of course, the fact these aren't actual bike lanes has not stopped the City from counting them as additional bike lane miles. 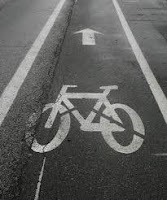 In a news release in April, the Indianapolis Mayor Greg Ballard bragged how the Madison Avenue bike lane would go from County Line to Shelby Street. But as I noted, it is not even a real bike lane. It is just painted emblems of a bicycle on the right side of a traffic lane. "I personally rarely ride in a bike lane. It is a death trap," said Scott Harris, a bike courier. Scott Harris is a professional courier and rides 20 to 60 miles a day. He has been hit by cars a couple of times. The problems he sees with the bike lanes is chiefly driver inattention "because you are either facing doors swinging open at you at all times and then you are also dealing with the turn lanes, the transition around the turn lanes. I would rather be a car lane with a car in front of me and car behind." The WTHR story also talks about how traffic lanes have been significantly narrowed. Many of the ones reduced to create bike lanes are now not even big enough to hold wide motor vehicles. As a result, the vehicle ends up with a tire on or in the bike lane. Let's see if IndyCog and other recreational biking groups will stop acting as cheerleaders long enough to address the very real safety problems of these bike lanes. I won't hold my breath. It i really bad. They have changed an already-crowded four-land Broad Ripple Avenue to an impossibly-jammed two-land thoroughfare. Drivers get nasty on BR Avenue, esp on Saturday afternoons. This is ridiculous. No, Brian's death was NOT due to bike lanes. He was on the sidewalk, crossed Banta using the crosswalk, then was attempting to cross Madison, again using the crosswalk. The truck driver 'swung wide into the left lane' (his words) and turned right. Best guess is Brian thought the truck was turning left or going straight and crossed in front of it. The project on Madison is not done yet. Here you go...using poor information to try and support your anti-bike lane rage. Also, as DI said he was on the SIDEWALK and using a crosswalk. If anything, the argument could be mad that it would have been safer to be in the road where the bike lane will be. Your arguments against bike lanes are now not only silly and pretentious-knighting yourself a "serious commuter" while saying people who use them are not, but they are using incorrect information to bolster your arguments. Shame on you. ..oh and maybe if you looked at the bike of the "professional courier" in the story you would have seen that he rides fixed, without brakes. I imagine this, combined with sidewalk riding and pedaling against traffic had something to do with him"running into cars." Not bike lanes. I have ridden NY and Michigan daily for 3 years and have somehow never been doored or felt unsafe.